Hey friends! I’m back to share a layout that was recently on The Cut Shoppe Blog using the Brush Up Alpha Cut File and the Selfies & Usies Cut File. I started in Cricut Design Space by slicing out the individual letters from the Brush Up Alpha Cut File. I cut each letter for the word ‘Elevator’ four times and then stacked them together to create dimension. I repeated the same steps for the word ‘Usie’ from the Selfies & Usies Cut File. Now I have to admit that I didn’t even realize the word ‘usie’ was a thing! I looked up the word ‘usie’ to be sure I was using it properly, and sure enough, any photo that has 2 or more people is an usie. I always thought that these types of photos fell into the ‘selfie’ category! Who knew?! I also cut a large circle in Cricut Design Space on a piece of purple cardstock and backed the circle with a patterned paper from the Pink Paislee Oh My Heart Collection designed by Paige Evans. I then placed my title on the layout. I had originally planned on using the same purple cardstock for my title, but loved how the white cardstock just popped off the page! Next I started working on my photo cluster. I used multiple die cuts from the Pink Paislee Oh My Heart Collection designed by Paige Evans. My photo is an usie taken in an elevator from our trip to Chicago last summer. Thankfully my family plays along with my incessant need to take photos! Ha! I also tucked die cuts from the Oh My Heart Collection along the edge of the circle. I also added a few chipboard pieces from the Thickers sheet and a washi strip from the Oh My Heart sticker book. I added my journaling to my page using my We R Memory Keepers Typecast Typewriter. To help the layout look more complete I added hand stitching using white embroidery floss around the perimeter of the circle. Here’s a video showing the process of how this layout came together. 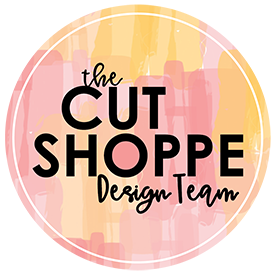 Remember to head to The Cut Shoppe Etsy Store to check out all of the cut files and digital collections! Thanks for spending part of your day with me! That is awesome when that happens 🙂 but thankfully in this situation, Ashley came up with the cut file and I just had to look up the definition of the word to be sure I was using it correctly! 🙂 Haha!! The word fit perfectly onto the layout and I love the font so I’m glad it all worked out! !